I serve roasted vegetables a lot, I love the flavours that roasting brings out, but almost every time I serve roasted broccoli to someone for the first time, or mention it in conversation I get blank stares or "You can roast broccoli ?" comments. 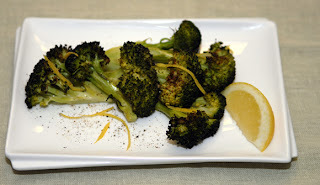 So I thought I'd share my method for roasting broccoli, it's easy, the prep time is minimal and it is delicious. Roasted broccoli is, in fact, so delicious that my 13 year daughter consistently has seconds and refers to it as broccoli candy. There are lots of variations and additions you can make but my basic roasted broccoli uses only four ingredients, broccoli, salt, lemon zest and olive oil, and is loosely based on one by The Barefoot Contessa, Ina Garten. Simply trim about a kilo of broccoli crowns into large florets, I don't peel, I'm sure some do, and put in a large bowl then salt generously with coarse sea salt and toss the whole mixture in 2-3 tablespoons of good olive oil and place on a cookie sheet. Preheat the oven to 450 degrees and place the broccoli in the oven, at the ten minute mark give the pan a shake and then check again at around fifteen minutes. The florets should be starting to brown, if so remove the broccoli and toss with the zest of half a large lemon and serve, if they are starting to char leave them in a few more minutes. Other variations involve adding minced garlic before roasting, or adding grated parmesan and toasted pine nuts after roasting, and these are very good but the simpler recipe is my favourite. The sugars released by the high heat work beautifully with the coarse salt, lemon and olive oil and the result is a great side dish for grilled meat or poultry. You can also toss the roasted broccoli with freshly cooked pasta, grated cheese, diced tomato and more olive oil to make a nice light vegetarian pasta main course. You can choose to toss with sesame oil and toasted sesame seeds for an Asian influence if you want, it's excellent with grilled chicken. So there it is, roasted broccoli, try it out and surprise your friends, my only advice is to make more than you think you'll need as it almost always goes quickly in my house. Tom Cruise as Jack Reacher.........really ?